The higher the SEER, the greater the efficiency—and the lower the operating cost. Compared to lower SEER units found in many homes, am Amana brand ASXC18 Air Conditioner provides significant savings on your electric bill.You can be assured that your Amana brand air conditioner will provide you with quiet operation. To minimize operating sounds, we’ve acoustically engineered our systems with enhancements such as a specially designed sound-control top.The compressor in your new ASXC18 air conditioning system is covered by a Lifetime Unit Replacement Limited Warranty. If the compressor ever fails, a new condensing unit will be provided to the original purchaser of the central air conditioning system as long as they live in the same single-family residence. All remaining functional parts are covered by a 10-Year Parts Limited Warrant ,Thermostats have evolved beyond just indoor temperature adjustments, and a ComfortNet communicating control offers an abundance of easy-to-use, comfort-enhancing capabilities on its stylish touch-screen LCD display. From programmable, scheduled temperature settings and optional remote system control to continuous performance monitoring and automated maintenance alerts, a ComfortNet control offers an advantage in home comfort and control compared to non-programmable thermostats.Innovative engineering, world-class manufacturing processes and the relentless drive to ensure each unit lives up to our uncompromising standards—these attributes define the Amana brand and result in the premium performance homeowners have come to expect from an American legend. 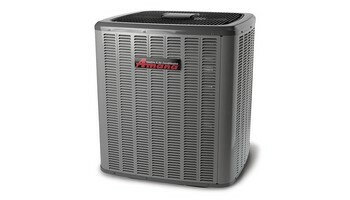 Assembled in facilities in Tennessee and Texas, Amana brand air conditioners are built to last and last and last.With Amana brand air conditioners, your comfort and savings start with a high-efficiency Copeland scroll compressor designed to provide years of reliable cooling comfort. Featuring the latest compression technology, overload protection andefficient design, the scroll compressor is complemented by our durable, high-efficiency condensing coil, which is made with corrugated aluminum fins and refrigeration-grade copper tubing. To truly seal the deal, Amana brand indoor comfort systems are backed by industry-leading limited warranties. The majority of our HVAC products are covered by a Lifetime Unit Replacement Limited Warranty while all Amana brand products feature a 10-Year Parts Limited Warranty*. Together these warranties combine to offer homeowners a level of purchase protection that’s the stuff of legend. Amana brand heating and cooling systems are a part of the enduring legacy of one of America’s most recognized and respected brands. Originating eight decades ago in Amana, Iowa, the brand is synonymous with long-lasting, premium quality products — from home appliances to heating and air conditioning equipment. Chances are, you and generations before you have enjoyed the dependable performance and longevity the Amana brand continues to deliver.